As previously mentioned, I was a fan of ‘Cluedo’ (known as ‘Clue’ in the USA) as a child, later moving on to ‘Mystery Express‘ as a more complex and engaging take on the format geared towards experienced gamers. Today we’ve got a recent Kickstarter that flips the classic ‘Cluedo’ on it’s head. You’re not competing to solve the murder…you’re competing to commit one! ‘Kill Doctor Lucky’ from Cheapass Games takes place in Lucky Mansion, the home to one Doctor Lucky. In every round Doctor Lucky moves from room to room along a prescribed path making his upcoming location predictable. The players take it in turn to move around the mansion and look for items to help in their mission or, if given the chance, attempt to murder the Doctor. As his name suggests the Doctor is exceptionally lucky and will manage to avoid most of the attacks, usually oblivious to what is happening around him. On their turn the players can move to an adjoining room or further if they play a ‘Move’ card. Once they have moved they can search the current location by taking a card or, if Doctor Lucky is in the room, attempt a murder. Neither of these can be accomplished if another player (or the dog) have a direct line of sight from their location to yours, so careful forward planning is needed to make sure everything falls into place, as the mansion can be tricky to navigate on limited moves. The strength of an attack is determined by how many attacks the player has already made and any weapons they are utilising. Each weapon gets a bonus when used in a specific room, meaning even more careful planning and timing is needed to make the most of them. When an attack is made it’s up to other players to sacrifice their cards to increase Doctor Lucky’s luck so that they may deliver the successful attack. An unusual twist to the game is the ability to change the order of play. When a character ends up in the same room as Doctor Lucky it immediately becomes their turn regardless of who was going to play next. This gives devious players the opening to skip over their opponents and mess up well laid plans by leaving their character in a room the Doctor is approaching. It is entirely possible to run several turns into each other by following the Doctor’s predicted path ahead of him, a particularly sneaky tactic that can get him into a prime murder location. The game included many bonus features that have substantially extended the value of the game. 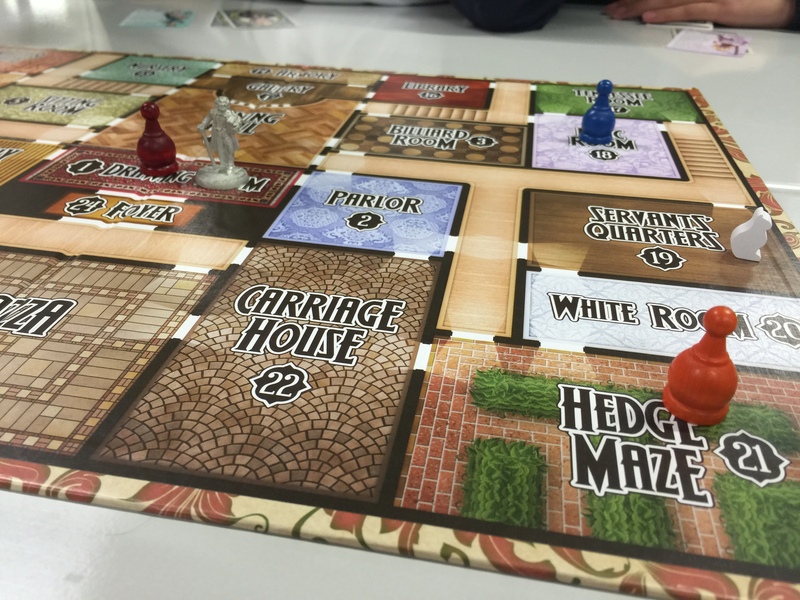 After reaching a set Kickstarter goal they added a second floor plan to the back of the board, a more complex two-level building for more experienced players. There’s also a dog and optional cat token that can be used to add more strategy to the game. The dog prevents the room they’re in from being searched or have a murder attempt take place, whilst the cat acts as a blind to block line of sight. They’ve also included rules for ‘Escape From Lucky Mansion’, where the dead doctor rises from the dead and the last player left standing wins. These small touches are excellent ways of giving the game more replayability. This is a super fun game that can be learned and played quickly. To succeed you need to be able to plan your moves far in advance and pay careful attention to where everyone else is going to end up. There’s a reasonable split between strategy and luck, as the person who wins will be relying on everyone else running out of cards at the right time. Delaying your action and adapting as fortunes change is essential. We found that the maximum player limit of eight detracted from the game as quite often one side of the table will be waiting a long time to do anything while the rest constantly move in Doctor Lucky’s path and skipping over them. 4-6 is an ideal number. 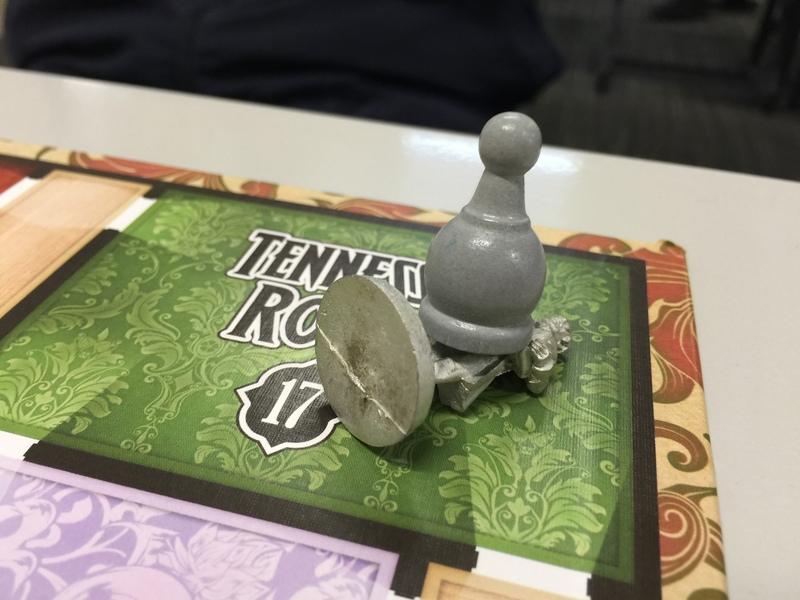 The game can be played in about 20-30 minutes, which makes it good feature at game days and it’s easy to flip over the board for a variation replay. Worth checking out.